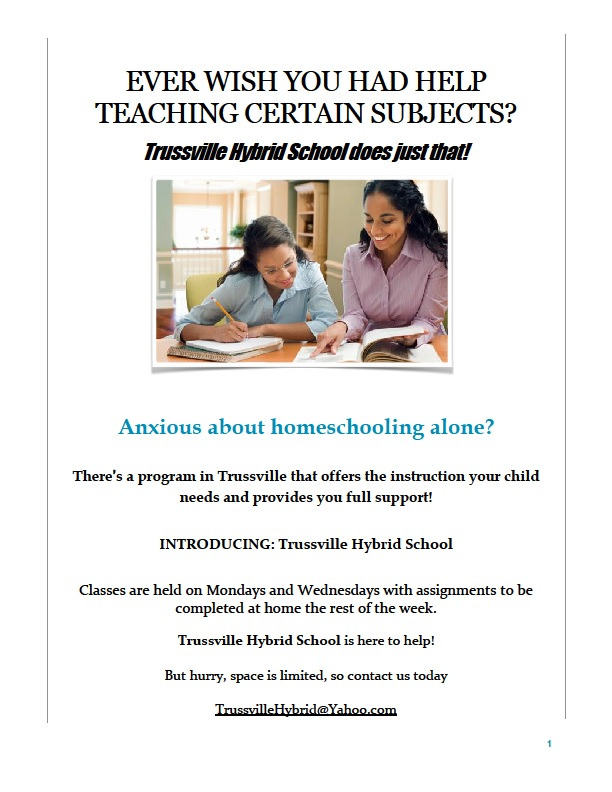 It has come to my attention that may homeschoolers in our community are unaware that Trussville Hybrid School offers classroom instruction two days a week for homeschoolers in the sixth through twelfth grades. I wanted to contact you and make you aware that this resource is available to your students. We are not a cover school. We are here simply to provide instruction and support to homeschooled students and their families. I have attached information explaining the services we provide. If you find that our services might be beneficial to your homeschool families, please forward them the attached information. We look forward to working with you to provide successful homeschool experiences to families in our area. Feel free to contact me with any questions you may have.